The Japanese Card of the Day for June 1st, 2018, is a Megacolony Triple Rare from V-Extra Booster 01: The Destructive Roar, Machining Mantis. Mantis is one of the Machining cards first used by Foo Fighter Kawanami Minami in the manga and 2018 anime series, and has been greatly updated over its 2011 counterpart. The original Mantis gained 3k if there was a Machining unit in the soul, while its reimagining can become a 15k for the turn able to reach 23 with an 8k booster or 29k with Phantom Black. The top 6 check should not go underestimated; along with High Dog Breeder Akane, Berserk Dragon (via its on-ride) Hi-powered Raizer Custom, and Conjurer of Mithril, Mantis is one of the only grade 2s in the entirety of Standard capable of getting a net +1. Like the old grade 3 searchers of previous formats, if Mantis whiffs its grade 3 check then he shuffles and gets you out of a situation where you weren't going to draw a grade 3 regardless. 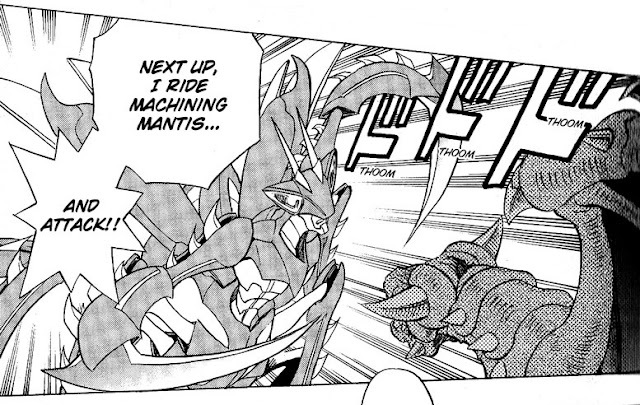 Although it's still early to be calling this, Mantis being on-place is likely to play into the greater strategy of the Machining cards as a whole. When the subclan's boss card, Machining Stag Beetle, first debuted in chapter four of the manga it had an on-ride skill to superior call two Machining units from the soul at rest and gain power equal to their own. This would in turn activate their own skills, and they could then be stood with the ability of Machining Worker Ant. Later cards like Machining Armor Beetle and Machining Little Bee further built on their soul-based play mechanics. 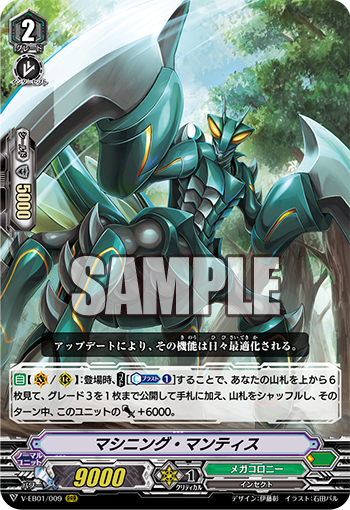 While we have yet to see exactly how Bushiroad intends to revise the boss cards for the reboot, we know that Stag Beetle is in the set, and retaining his old superior call skill would let you reuse Machining Mantis. So you could ride Mantis on your grade 2 turn, grab a Stag Beetle out of the top 6, then next turn ride Stag Beetle and superior call Mantis to reuse its skill and top 6 another Stag Beetle to ride the turn after. Taking into account the Protect Gift you'll be getting from that on-ride, that can stack into a net +4--provided Bushiroad doesn't reimagine Stag Beetle entirely, as they did for Perfect Raizer. So far most of the manga cards have taken a broad-strokes approach to matching their original effects, with Imperial Daughter gaining power and crit but ditching the no-rearguards mechanic, and Waterfall soulblasting a grade 3 for power, critical, and Sentinel blocking rather than discarding a grade 3 just for raw power. The previous Japanese Card of the Day was Front Line Commander, Sigiswald.